It has been quite a week for the cartoon industry. Seems like everyone either insists they are Charlie, or wants to murder them. I checked out the Charlie Hebdo covers published by The Huffington Post and found them adolescent and poorly drawn, sometimes obscene but never particularly funny. Certainly not worth the effort of killing the artists or, as it happened, dying in the process. Scurrilous cartoons go back a long way. So does naughty language. After I published The Throne in the Heart of the Sea, one reader complained that I shouldn’t have my characters use bad words, because people in the Bible don’t do that. Well, maybe not in the King James translation, but some of the original biblical Hebrew is not exactly fit for Sunday school. The oldest lewd cartoon I know of was found in a tomb, and dates back to the 15th Century BCE; it is believed to depict Hatshepsut, one of the few female rulers of ancient Egypt. She assumed the title of pharaoh—king, rather than queen—and wore the royal regalia, including the double crown and the false beard. 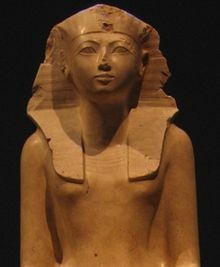 Her major accomplishments included opening up trade routes that had been disrupted when Egypt was occupied by foreigners, and commissioning hundreds of grand building projects, more than any other pharaoh of the Middle Kingdom. “But what about that cartoon?” you ask. That’s it, up at the beginning of this post. Most likely drawn by a worker after the funeral, it depicts the pharaoh being shtupped from behind by a guy whom archaeologists think might be her steward, Senemut. (He was reputed to be her lover.) The cartoon showed a shocking disrespect for royalty—and likely a big dollop of misogyny as well. I’m sure there have always been men who resented a woman boss. The drawing is still there, some 3500 years later, along with other obscene graffiti, so I guess the artist got away with it. He probably didn’t suffer the fate of the Charlie Hebdo cartoonists, or the hundreds of media workers imprisoned in modern Egypt and other countries because of what they wrote or depicted.